With over 250 student-run clubs, an extensive athletic center, and nightly events, Rochester’s campus rarely slows down. Most students love it so much that they decide to live on campus all four years. Aside from its proximity to classes, the library, and University events, on-campus housing gives students the chance to meet others and participate in school-sponsored activities. Learn more about campus housing. Did you know 90% of Rochester students live in campus housing? 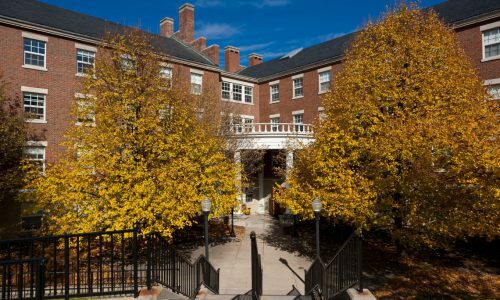 Incoming first years are required to live on campus and have a choice between Susan B. Anthony Halls, Genesee Hall, and the Quad, comprised of Gilbert, Hoeing, Lovejoy, and Tiernan Halls. First years are housed together, and most will share a double room with another first-year student. However, there is also a limited number of single rooms and some triple rooms for first-year students. First-year students who wish to combine their living experiences with sustainability efforts and education on campus may decide to participate in the EcoReps Program to help educate floor mates on environmental issues through activities and events. Affinity themes include quiet-study, substance-free, co-ed by random room (male and female rooms on the same floor with separate bath facilities), etc. Students have many housing options to choose from. Many upperclassmen choose to live in suite or apartment-style housing on campus. Some also decide to be a leader in the first-year dorms as a Residence Assistant, Freshman Fellow, or D’Lion. Returning upperclassmen will enter housing selection lottery in March. Some upperclassmen and incoming transfers may live off campus as there are many affordable options available in the Rochester area. Get more information about living off campus and resources for students through the Office for Off-Campus Living Programs. Residential Life maintains a self-serve housing search engine where landlords list their available properties. You can also search for roommates under “shared housing.” Check out the off-campus housing database. The University of Rochester is home to over 2,300 international students and scholars from around the globe. In fact, our incoming class is one third international! More than 120 countries are represented in the University’s global community, making our campuses dynamic and eclectic. 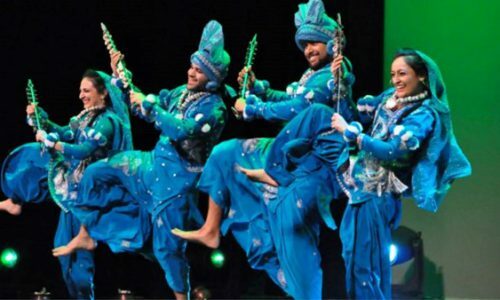 With such a diverse student population and numerous cultural events and activities, the University of Rochester prides itself on being a global village. The surrounding city also provides a welcoming environment for students from all over the world. For upperclassmen seeking to integrate their interests with their daily lives by living and learning in an environment with others with common interests. 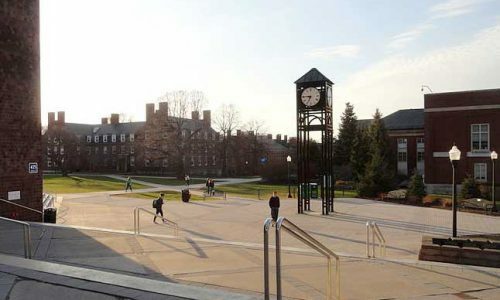 This housing includes the Music Interest Floor, Drama House, Douglass Leadership House, Anime Floor, Computer Interest Floor, Green Space, Film Interest Floor, Interclass Living Community, and the Tiernan Project (community and University service). Over time floors and interest communities can change as student interest does. All College housing is smoke free. If you or your roommate choose to smoke, it must be 30 feet from any building. We still ask you to indicate your smoking status and preference for a smoking or nonsmoking pairing on the housing application. Fraternity and sorority membership is a lifestyle option for undergraduate students. Approximately 22% of the students at the University of Rochester belong to Greek-letter organizations and have the option of living in chapter houses or special interest residential areas on and off campus. The dining options on campus truly fit the college lifestyle. Whether you’re grabbing a cup of coffee on the way to class, eating a slice of pizza after a late-night study session, or catching up with friends at Sunday brunch, Rochester has many options to suit your needs. All these different dining options are included in a comprehensive meal plan, which can be accessed with a swipe of your ID card. Learn more about dining services. The Commons in Wilson Commons offers a variety of lunch and dinner options, ranging from sandwiches to sushi, pizza to pulled pork, and bagels to burritos. There is also a Starbucks on the third floor of Wilson Commons. If you’re looking for a traditional, buffet-style dining hall, Danforth is the place for you. It’s conveniently located on the first floor of one of the first-year residence halls. The Faculty Club delivers upscale lunch options in a sophisticated atmosphere. With a daily changing menu of soups, entrees and salads, The Faculty Club is the perfect spot to gather on campus. Private rooms are available for meetings as well. Right next door to Danforth is Hillside Market, offering an espresso shop, grocery items, hot food, and much more. It’s open late for students up at night studying or hanging out with friends. OptiKale is our latest dining location on campus. This innovative concept offers a health-focused menu featuring made-to-order bowls filled with fresh produce, grains, bone broths and proteins. Rochester participates in Division III of the NCAA and is in the University Athletic Association and the Liberty League. 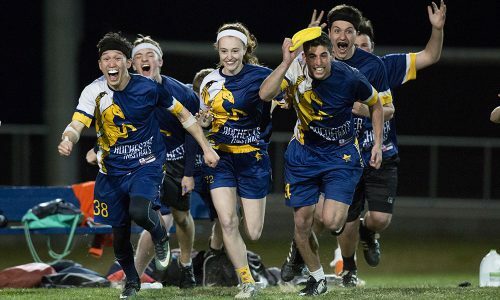 The University has a wide variety of varsity, club, and intramural sports, giving students the opportunity to compete against other schools, improve their skills, and build lasting connections with other students. The main athletics facilities on campus are the Goergen Athletic Center and Fauver Stadium. Club sports allow athletes to compete against other schools without the pressure of conference competition. For those athletes who want to play for the sheer love of the sport, intramurals provide a great opportunity to get exercise and to compete in a more casual environment. With music from a cappella to orchestral, dance groups from ballet to hip-hop, and a wide variety of theatre and visual arts, Rochester has an exciting arts and culture scene representing many countries around the world. Part of what makes the Rochester experience so fun and memorable is the host of rich campus traditions here. Learn more about Rochester’s traditions. This tradition arose following the University’s highly successful Sesquicentennial celebration in 2000. The annual event combines Homecoming, Reunion, Family Weekend, and the Stonehurst Capital Regatta with activities that include top- notch entertainment, a festive atmosphere, and informational seminars by both University and outside experts speaking on a variety of topics. There is a superstition about the clock tower located in Dandelion Square. If you walk under it as a prospective student, you won’t be admitted; if you walk under it as a current student, you won’t graduate on time. So walk under the clock tower at your own risk! Held at the end of spring classes, Dandelion Day is a day for students, faculty, and staff to bring their entire families to this on-campus carnival. Aside from rides, games, and food, the Campus Activities Board schedules a performance from a major music group. Modeled on a celebration held at Queen’s College in Oxford. Costumed faculty, administrators, and student leaders as well as University-wide participants enjoy a medieval-style celebration and meal just before winter break. A University-wide community service project, more than 900 first years, staff, faculty, and alumni go into the Rochester area on the Friday before classes and perform a variety of community service projects. The day was named Wilson Day in memory of late Joseph C. Wilson, the president of Xerox, a University graduate (Class of 1931) and trustee, and one of the University’s greatest benefactors. The University of Rochester is committed to supporting sustainability initiatives that promote green living on campus and in the community. Students interested in green issues will find lots of ways to get involved at Rochester. 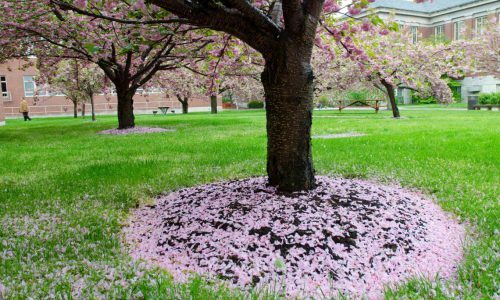 Learn more about student sustainability groups on campus, and about Rochester’s sustainability initiatives. Through planned activities and events, residents are educated about environmental strategies like waste reduction and energy conservation. There is also special interested housing for students who want to live green. Residential Life uses compact fluorescent light bulbs and employs energy-saving lighting systems throughout its halls. Showers have been retrofitted, dripless faucets installed, water fountains are equipped with bottle refill spouts, and front-loading washers foster water conservation. Official reuse and recycling programs collect and process old furnishings, electronics, materials, and metals. 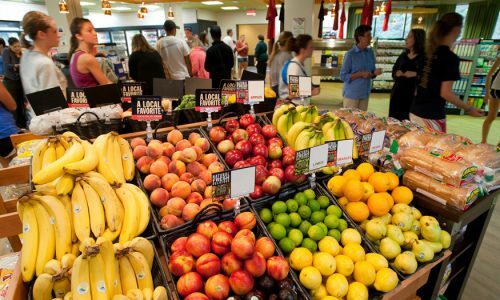 More than ten campus eateries provide fresh food that is, whenever possible, locally grown. In recognition of Dining Service’s commitment to buying locally, the University was named the first college member of the Pride of New York Program.